Master Po: Your final test, the urn of the two symbols: the dragon and the tiger. When you can walk in this corridor, the inner path to the outer world, and can push the urn aside with your forearms you will bear its markings with you for the rest of your life. Kwai Chang Caine: Hundreds of pounds of burning coal and iron. How can I Master, having only the strength of a man and the weaknesses? Master Po: It is because you are a man that you can do this, Grasshopper. Kwai Chang Caine: I do not understand. Master Po: As the softest clay, in time, becomes the hardest brick; a fragile leaf, a diamond; as a stream of fiery ore freezes into unbending iron, so too may a man ascend to himself. Master Po: By slowly forging the chi within yourself, the bond between the finite and infinite, the inner essence of your spirit, and the limitless power of the universe. Kwai Chang Caine: How can I do this? … and the rest is legend. Well, at least in the entertainment world. From a birding perspective it simply represents another new bird encounter while on our Minnesota Birding Trip back in July. As with the last post on the Marsh Wren and a few back with the Black Terns, this particular Sparrow was spotted while we were at Sherburne National Wildlife Refuge outside of Minneapolis MN. We found this refuge on a website that listed the best birding areas around Minneapolis. Without a doubt, I can officially confirm that entry on the list. Sherburne is a fantastic location with a range of habitats to observe – trees, prairie and marsh. All easily accessible and viewable from the car. We did get out of the RV at the first pull off to take a short trail through the prairie. It is on that trek that I heard a very distinct noise coming from a good distance down and slightly off to the side. Sounded like a very loud insect possibly rubbing its wings together. Took me awhile to pinpoint the source of the noise – a bird perched on the very top of a large weed. My Brother Ron had mentioned this particular bird on a previous outing with him allowing me to quickly guess I was witnessing a Grasshopper Sparrow. Hit the jump to read and see a bit more about our featured feathered friend! Definitely a ways off – the Beast was at full extent just to bring him in enough to tell it was indeed a bird. One of my golden rules came into play – get something in the tin and then move in to improve. I took some shots from the start of the trail and then proceeded to move closer taking up a position every 10 or so feet further to retake the shots. You can tell from most of these shots, this particular specimen was keeping a watchful eye on me. It didn’t take too many iterations of foot zooming until decided the threat level had raised too high and opted to move to greener pastures (literally). For the rest of the trail I had a big smile on my face confident that it was a new +1 on my birding check list all while feeding the local mosquito population. Next stop was the pond we got the Black Terns and the Marsh Wren covered in previous posts. While taking shots of the Wren I heard a now familiar insect sound. Pulled myself off the Marsh and swirled around to see the source of that sound. 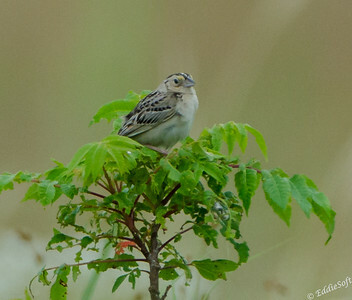 Looks like either same or possibly new Grasshopper Sparrow had taken a perch on a small tree 15 or 20 yards away. How convenient! Again, with the quick shots to have something in the Tin and then some small steps to the other side of the road for a closer look. Sure enough, side yellow markings around the eyes and a buffy chest – that being another Grasshopper encounter. I’ve gone years without seeing this species and now I have two good spottings in less than 15 minutes. Did I mention Sherburne rocks when it comes to birding? If not then let me tell you, Sherburne rocks when it comes to birding! Oops, ran out of pictures. Since this is a new bird, let me go and check if Cornell has any interesting facts. I figured it got its name from the sound it makes, but Cornell indicates that it is also a diet source for them. They actually rip the legs off grasshoppers and feed the body it to their nestlings. Kind of ironic in context of the Kung Fu show isn’t it hehehe. There are twelve sub-species of this Sparrow which covers a bit more than the entire Eastern half of the US and all of Central America. Not much beyond that – pretty disappointing Cornell, you need to step up your game a bit on this Sparrow … and the Marsh Wren from the previous post. Well, just about my turn to drive so better wrap up this post. Hoping you enjoyed reading about my newest +1 to my birding list. Need to get a few more posts done this month, but all in all in much better shape that last month. 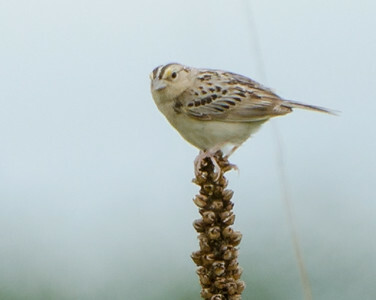 Nice–I think I only have pics from one bird outing that included a Grasshopper Sparrow. 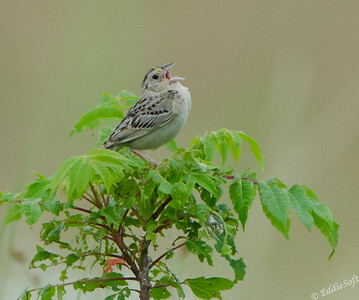 When seen among the dense grasses where it breeds, this small, short-tailed bird appears big-headed and large-billed compared to other sparrows. Both males and females sing, and Grasshopper Sparrow is one of the few sparrow species in which the male sings two different songs: one to attract a mate and another to defend a breeding territory. 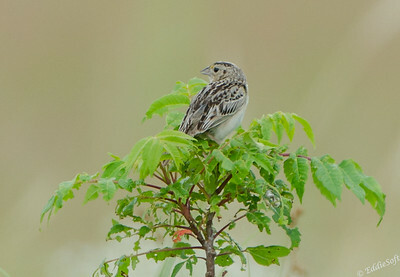 Twelve subspecies of Grasshopper Sparrow are recognized. Of the Florida subspecies (Ammodramus savannarum floridanus), fewer than 200 birds remain, all in the dry prairie ecosystems of that state. This subspecies is listed as Endangered by the U.S. Fish and Wildlife Service under the Endangered Species Act. 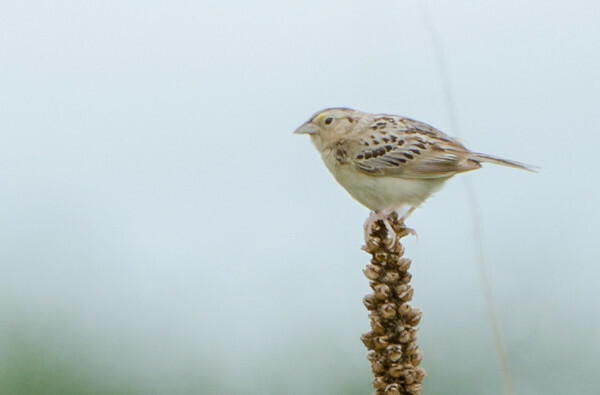 Partners in Flight classifies the Grasshopper Sparrow as a “Common Bird in Steep Decline.” This sparrow has lost 68 percent of its population since 1970, mainly due to loss and fragmentation of its grassland habitats. In addition to the ESA protection of the Florida subspecies, the entire species has been identified as a focal species for conservation by the U.S. Fish and Wildlife Service, and an Assessment and Conservation Plan has been developed. This comment may actually be bigger than my post – yeah! I might have been with you on that outing – did you get that at Medewin or was that somewhere else? Interesting, I was aware (as you are) that the Killdeer does the broken wing act, but was not aware that the Black-Necked Stilt did that and certainly had no clue on the Grasshopper. You would think Cornell would have mentioned that. Per your reference it looks likes these little specimens are having a tough go of it. I will admit, that when I see numbers like 200 I tend to question the accuracy of that. This is the first I have ever seen them and they are supposedly in our range. Claiming 200 in an entire state is either very conservative and they haven’t seen them for a long time, or overly constrained due to lack of visibility. Tough to say, but concerning nonetheless. Previous Previous post: Wren Are You Gonna Stop So I Can Take a Pic?